St. Ansgar's Worship Service is at 9:30 am on Sunday mornings. The liturgy and music of the service is a blend of traditional and praise styles. Fellowship coffee and cookies follows Worship each Sunday. 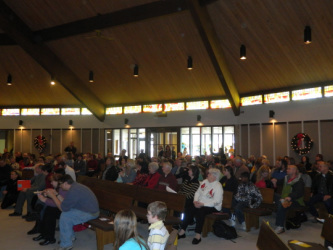 A children’s sermon is given at each service. Nursery is available during service. Prayer with a pastor is offered after every service. Wednesday Evening Worship at 6:00 pm in the Fellowship Hall. Full Contemporary Christian Music - Kid and Family friendly. Video clip summary of "The Story" lesson each week. Adult and children coordinated learning time. Shorter weekly worship service followed by "The Story" Church School lesson and Adult Bible Study. St. Ansgars practices open communion. All who believe in Jesus Christ as Lord and Savior are welcome to the Lord’s Table. We offer instruction for “first time” Communion in 5th grade. If a child from another congregation has received instruction at a younger age, we honor that instruction. If parents of a child younger than fifth grade believe that their child is ready for instruction, we will offer that instruction to children younger than 5th grade.